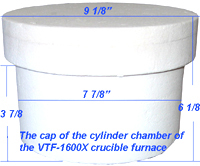 EQ-VTF-1600X Furnace is designed for melting metal and crystal growth via TSSG. 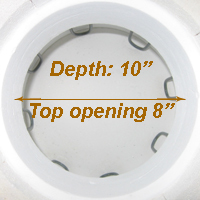 The furnace has a vertical chamber with top load and a pulling equipment can be attached to the furnace easily. The furnace consists of high quality alumina fiber brick and MoSi2heating elements with chamber of 13" Diameter x 10 " high, and can be used up to 1600ºC (2912ºF). The Precision digital temperature controller with 51 segments programmable is built in the furnace. 45" x 45" x 52"
View Operation Manual Download Catalog Flyer Customized mechanical pulling machine is available upon requestion. Warning: MoSi2 heating element is used in the high temperature under oxidizing atmosphere. It will form the SiO2 film which can keep the element from being melted. During the oxidizing process, the SiO2 protecting film is formed again when the element continues to be used. The MoSi2 heating element must not be used in the temperature between 400ºC and 700ºC for a long time, otherwise the element will be cremated under the strong oxidizing function in the low temperature.